Hello and welcome to Savvy Little Home. We provide you with updated information about home security and other home-related topics. 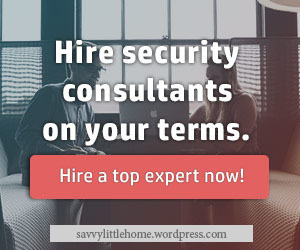 We craft informative articles to help you know the ins and outs of home security and make informed decisions when setting up the system in your own abode. Around 30% of all burglaries are via open or unlocked doors and windows and around 66% of the victims are residential areas. Homes without home security systems in place are 300% more likely to get broken into. That is why we want to promote home security far and wide. Here, you get to know more about home security equipment, full-time security alarms, electronic, electronic fence, audio and video door phone, etc. We strive to provide valuable content to our readers. Knowing the importance of home security, we would like to share our knowledge when it comes to this handy technology. We feature domestic, industrial and commercial security solutions. The power of home security can be applied to just about any settin and industry. That is why we want to build an exclusive platform to feature just that. We hope that in the coming years, we will have expanded, and have become one of the leading home security resources online. We strive to provide fresh and updated content about the industry to continue giving value to our readers. Home security knowledge is essential for you to keep your loved ones safe from attacks such as break-ins. We advocate home security because we believe that every home should adopt this technology to promote further safety and keep families extra secure. We hope that in the coming years, this technology will be more accessible to more homes across all countries to make the world a safer place on the whole.